What outfit does the mod screenshots use? 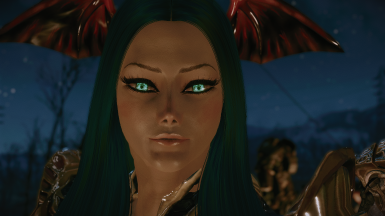 I'm using TERA Succubus Mashup. Face looks more Egyptian on the first pic, and there's hard to see much of it on the rest with the location and time of day being too dark. I apologize for picture quality, as I'm am not the best in taking screenshots. I'll see if I can find a better place to take pics the next time I'm playing. As for the Egyptian looking face, I'll try to update her appearance and release it at a later time. I'm currently using a custom Atomic Beauty preset, which I'm constantly changing. If I get around to it; I might upload the current preset. I might also try to make a preset that closely resembles her actual body; if people are interested.